My wife, daughter and I were on our way out of a fast-food restaurant a few days ago when a car pulled up in front of us. Out the of the car emerged a husband and wife who were both totally engrossed not in each other, but each in their own cell phone conversations. They didn’t speak a word to each other…totally devoting their attention to the person they were speaking to on the phone. Neither spoke to us even though I smiled and said, “Hello.” He didn’t hold the door for her, and while I didn’t see them once they were inside the restaurant, I would imagine they didn’t stop their conversations before ordering their food. What kind of society do we live in? One that has a cell phone addiction. 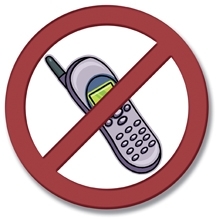 Seriously…I dare you to go into a public place and find ONE person that doesn’t have a cell phone. It’s crazy…when did we get to the point that we had to be connected to everyone, all the time? My wife has teased me ever since we got married about my lack of cell phone usage. I hate cell phones. I think they might as well be shown as the ball & chain that they are. Think about it for a second. Why do you need to be reached 24/7? Some might say for an emergency, and for that reason, I would agree. But, does your office have your cell phone number? Why do they need to reach you outside of office hours? Do they own you? Up until recently, I never had my cell phone on. As I viewed it, the purpose of my cell phone was in case I needed to call someone in an emergency. Recently, I’ve been using it for speaking contacts, so it is on, but I don’t always answer it. If you call me after office hours, and I don’t recognize the number as a family member or a friend, I won’t answer…for ANY reason. The way I see it, my priorities are set, and no one can change them but me. I don’t mean that to say that you aren’t important to me, but rather, you are not as important as my down-time with my family. We have to put limits on outside interruptions when we are with people that matter to us the most. So…try turning your cell phone OFF next time you are with your family. Not to the vibrate/silent mode…I mean OFF. Put a limit on how often you can be interrupted. I promise the world won’t fall apart without you. Learn to enjoy not being needed all the time.